Autonomous Learning. Given a sample of web requests towards your web server, it can learn autonomously the profile of legitimate traffic, exploiting a number of machine learning algorithms. Anomaly-based Approach. 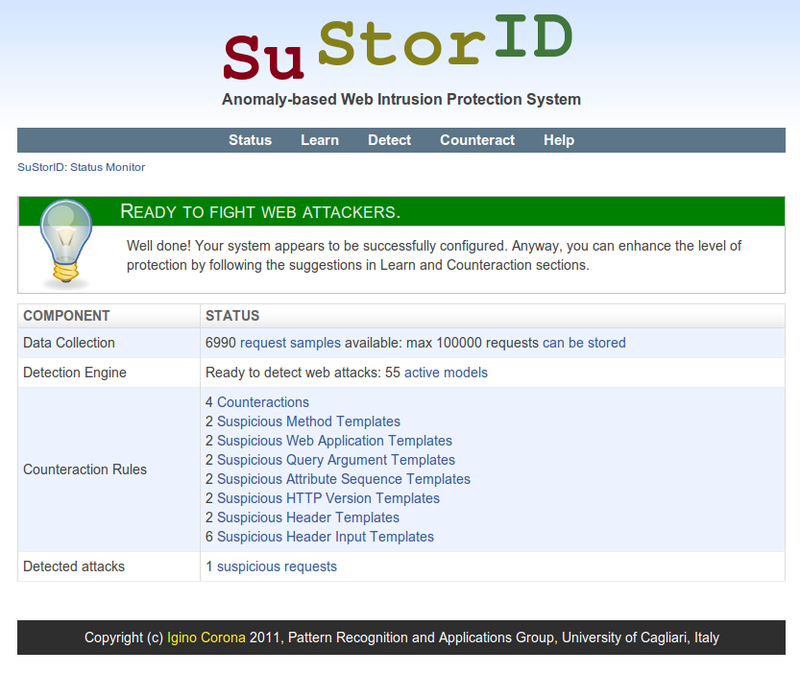 SuStorID detect known as well as unknown (never-before-seen) web attacks by highlighting anomalous traffic. Multi-model Architecture. A multi-model architecture is employed to characterize different categories of anomalies and provide a human-readable representation of anomalous events. Real-time Counteractions. Depending on the set of raised anomalies and their reliability, a different counteraction can be taken. Easy integration with modsecurity. 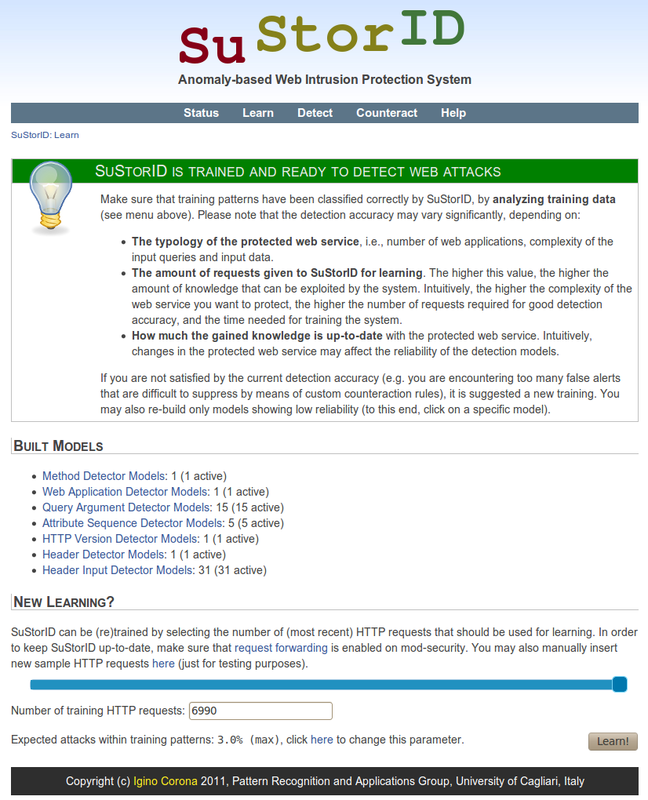 SuStorID can be coupled with modsecurity, the well known web application firewall, to gather training data and provide for real-time counteractions. 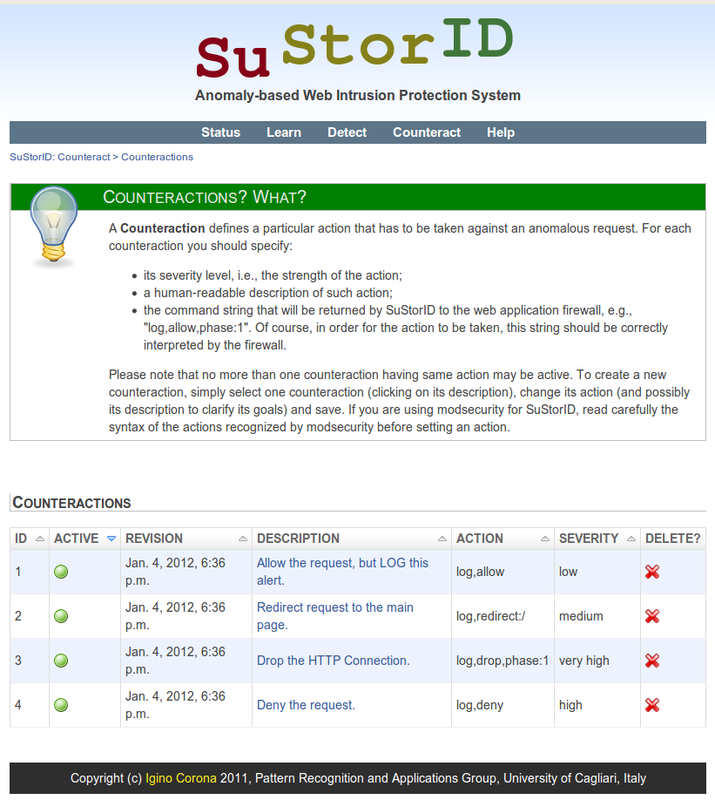 So, SuStorID is a host-based Intrusion Detection System, and by means of modsecurity can access internal web server’s data (i.e. request and response message fields) exactly as Apache does. Inspection of Encrypted traffic. Since SuStorID can directly access Apache’s internal data, it can monitor both HTTP and HTTPS traffic. User-friendly Interface. 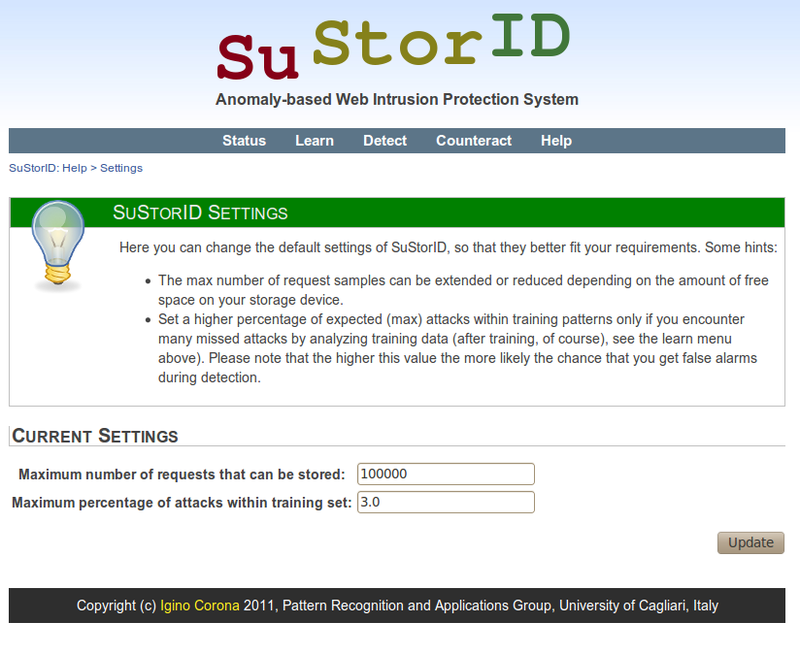 The IDS interface is very important to investigate security issues, so SuStorID itself has been implemented as a web application with a user-friendly interface. SuStorID is written in Python exploiting the amazing Django framework, and some machine learning algorithms have been implemented in C language. Have you got any problem? Did you find any bug? Would you like to send suggestions? Send an email to igino <dot> corona <at> diee.unica.it . Are you a researcher working on web security? Feel free to contact igino <dot> corona <at> diee.unica.it to join the SuStorID development team. There are a number of improvements and additional features that we plan to develop in the future, towards a safer World Wide Web. 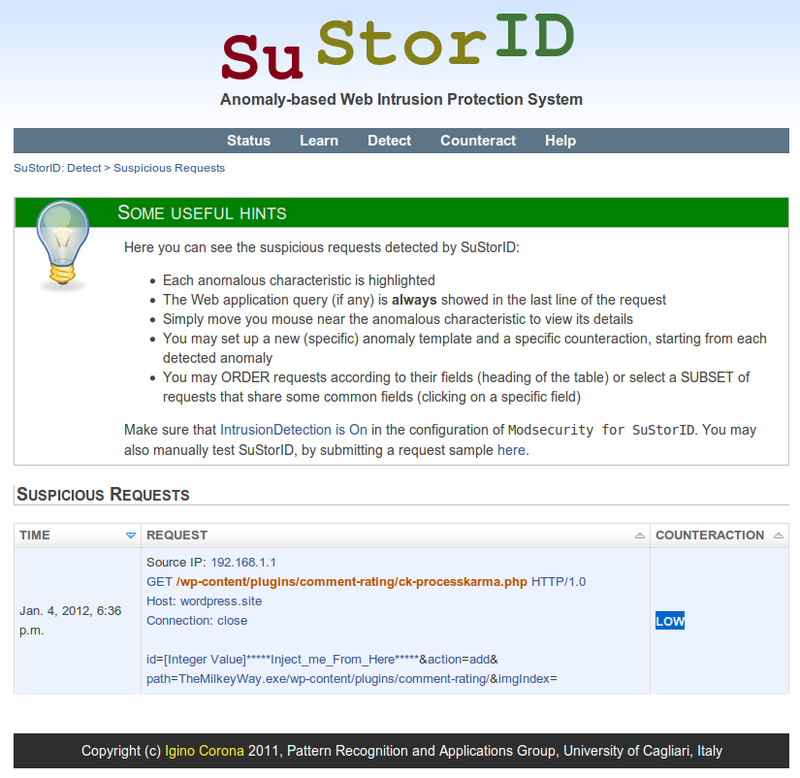 Igino Corona, Roberto Tronci, Giorgio Giacinto, "SuStorID: A Multiple Classifier System for the Protection of Web Services". In: International Conference on Pattern Recognition (ICPR 2012). International Conference on Pattern Recognition (ICPR 2012). Tsukuba International Congress Center, Tsukuba Science City, JAPAN: IAPR; 2012.